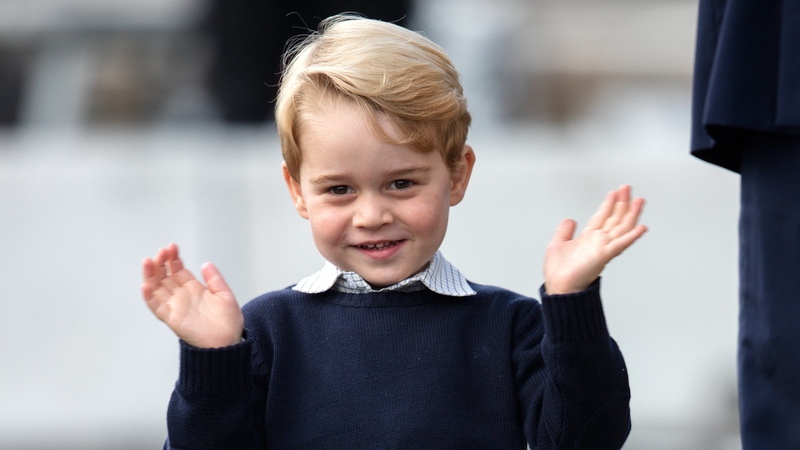 Prince George is turning 5 on Sunday, thank the Lord. Because if any kid needs an over-the-top, tacky, Kardashian-esque party, it's poor Prince George. His brand-new baby brother (the smiley Prince Louis) and little sister (firecracker Princess Charlotte) have been stealing the show of late, so we're hoping most of his birthday gifts will be more, well, fun than what the Royal Mint has come up with: a limited-edition commemorative coin featuring the little prince's namesake, Saint George, who is the patron saint of England. Saint George was a mythical dragon-slayer, so we hear. As if being third in line for the throne weren't enough pressure. Jeez. This got us worrying a wee bit about the future King of England and the kinds of gifts that are deemed appropriate for such a 5-year-old. What's next, royal scepters? The skulls of England's vanquished enemies preserved under glass to be kept bedside? Well, kind readers, fear not: George isn't doing half bad in the royal gift department, and neither are his siblings, for that matter. Kensington Palace releases lists of gifts received by the royal family (including gifts received while on tour). In September, during their first visit to Canada as a family of four, Prince William and Duchess Catherine received numerous prezzies for George and Charlotte. Who won that round? Prince George: magnetic building blocks, books, a Lego set, wool mittens, T-shirts (we're not sure George knows what a T-shirt is, but OK), Wellington boots, a stuffed bear, a stuffed moose, a stuffed husky and a stuffed fox terrier (not taxidermy) and — most peculiarly — a packet of "hair clips." Hmmm. Princess Charlotte: fridge magnets, a preserved rose (hello, Beauty and the Beast), a toy tiara (until she can get her hands on the real ones) and a lace snowflake. Winner, Canada round: Prince George. Not even close. Fridge magnets, pffft. Prince George and Princess Charlotte: received 38 presents between them on the family's tour of Poland and Germany in July. We don't know who swiped what, so it's hard to say who made out better with this lot, which included "17 soft toys, seven books, two lollipops, three toy trains, a toy pram, three dresses, two pairs of socks and a dreamcatcher." Winner, Poland and Germany round: We'll call it a draw between George and Charlotte. Back in 2015, when it was only Prince George on the royal baby scene, his father, Prince William, visited Japan and brought home some cool gifts for his son. Prince George: a samurai painting, a wooden toy, two Kendama games and a stuffed animal. Winner, Japan round: Ah, the days of being an only child. George wins by default. Prince Harry also occasionally gets gifts to tote home to his niece and nephews. In New Zealand last May, Harry scored a bunch of swag for his fave royal rug rats. Prince George: stuffed penguin, personalized sports jersey. Princess Charlotte: stuffed penguin, snowsuit, pj's, bib, quilt, personalized sports jersey. Winner, Uncle Harry goes to New Zealand round: Princess Charlotte takes this one. And Grandpa Prince Charles scooped up some sweet gifts for the littles when visiting the Republic of Ireland. Prince George: knit sweater, huge lollipop. Princess Charlotte: wooden rattle, knit dress, hand-crocheted stroller blankie. Winner, Grandpa goes to Ireland round: Princess Charlotte. We'll continue to keep track of the swag — birthday and otherwise — that floods the royal household. But for now, let's all keep our fingers crossed that George has a rockin' fifth birthday and gets all kinds of presents he can't wait to play with. We bet he will remember to say thank you for every single one too. He's classy that way, Prince George.